Ideally, lakes are sampled within 1 day of satellite overpass, but usually data collected within 3 days are acceptable. Please opt for the day with least cloud-cover. Please consult the map below to determine if your lake is on Path 12, 11 or Path 10. Please note that in some areas of the state there is overlapping of paths, so people can choose the most cloudless day given weather forecasts. To view some of the previously collected data, please consult this list in PDF format. Lakes are listed in numerical order, according to the lake’s MIDAS number. Path 12 lakes begin on page 26. Please note: this list is not comprehensive. 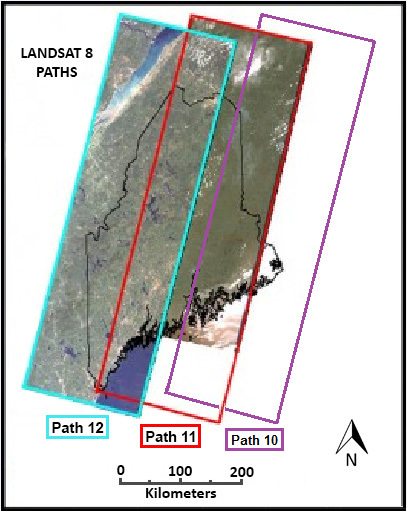 As the Landsat 8 satellite orbits the earth it takes photos of Maine lakes and ponds (as well as other features of the earth’s surface). The satellite images could be used to help characterize the transparency for many Maine lakes (thousands!) for which we do not have current water quality data. Volunteer lake monitors can play an important role in helping to “ground truth”, or calibrate the satellite images by taking Secchi disk transparency readings on the days when the satellite passes over Maine.